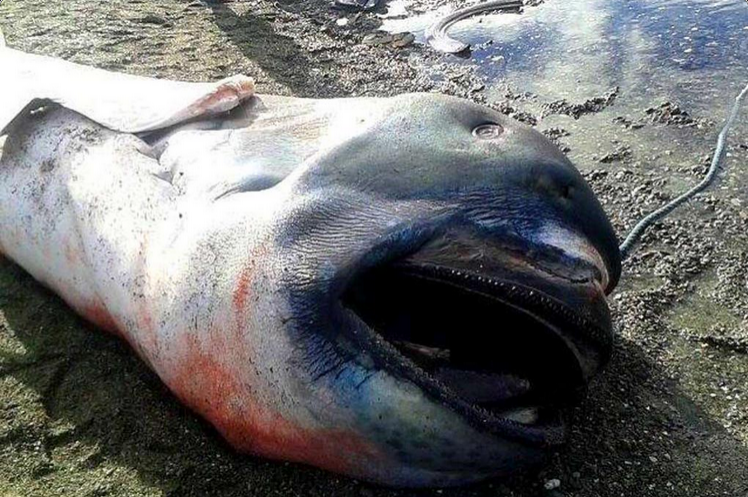 Since Fukushima, 5 MegaMouth Sharks have been killed in the Pacific, one of them just today in the Philippines. That might not sound so terrible, after all the Pacific is a Huge Place! However, in all of recorded history only 61 MegaMouth Sharks have ever been seen alive, seen dead, or caught. Some have been caught, tagged and released. Almost all of the radiation stays in the top 250 feet, those scientists claiming "dilution" as the solution are deluded at best, and intentionally lying with diasasterous effects. Like Ken Busseler. But all the ocean scientists "knows" that the Mega Mouth Sharks are "deep water" sharks, so they are dismissing any link to the Fukushima Radiation. Only 61 have ever been seen in the whole world for all time, and now 5 have died in the Pacific Ocean since Fukushima. Fact 1: The Mega Mouth is a "filter feeder" one of only 3 types of sharks to filter feed. Fact 3: They live during the day, deep, like 400 to 600 feet, but at night they come up to 40 to 80 feet and filter plankton all night using luminous photophores around it's 1.3 meter wide mouth. Fact 4: Almost all the radiation stays in the top 250 feet, see link above for proof, from Woods Hole of all organizations. Fact 5: The Pacific is being Decimated, and larger and larger life forms are having mass die-offs. On 12 June 2011, a 3-m (10-ft) dead juvenile male was found by fishermen near the western Baja California peninsula coast, in Sebastián Vizcaíno Bay. It was picked up by the same fishing vessel that in 2006 captured another megamouth specimen in Sebastián Vizcaíno Bay, which has led Mexican scientists to believe that the megamouth could be a seasonal visitor to the Baja California peninsula. The new specimen was taken to Ensenada, where it was photographed and sliced in order for Scripps Institution of Oceanography and Mexican researchers to study the structure of its muscles and gills. On May 7, 2014 a 3.96-m (13-ft) 1,500-lb (680-kg) female shark was captured at a depth of 2,600 feet (790 m) off the coast of Shizuoka, Japan. The body was dissected in front of the public, by staff at the Marine Science Museum in Shizuoka City, Japan. On June 30, 2014 a 1,102-lb (500-kg) female shark was captured in the shallow waters of Cagayan de Oro in the Philippines. Samples were sent to the Bureau of Fisheries and Aquatic Resources in northern Mindanao (BFAR-10) and the outer skin is to be stuffed for a local museum. 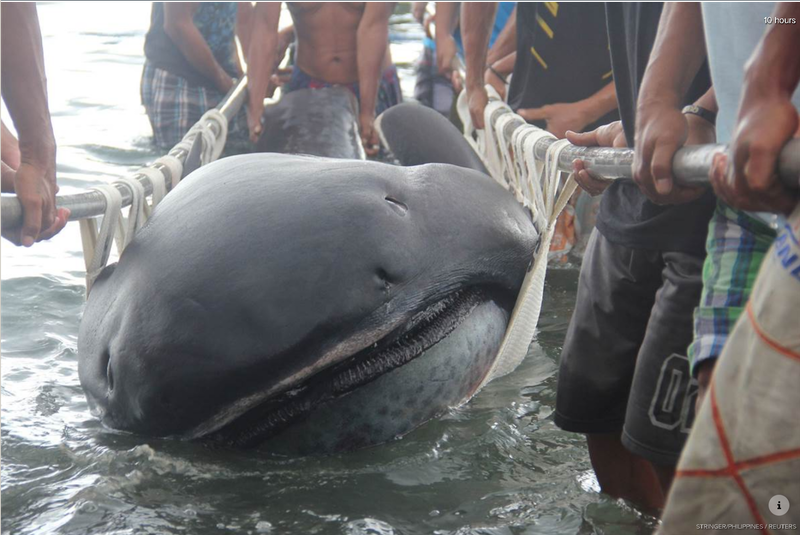 On January 28, 2015 a 15-ft. (4.5 m) deceased megamouth shark was found by residents of Barangay Marigondon, Philippines. 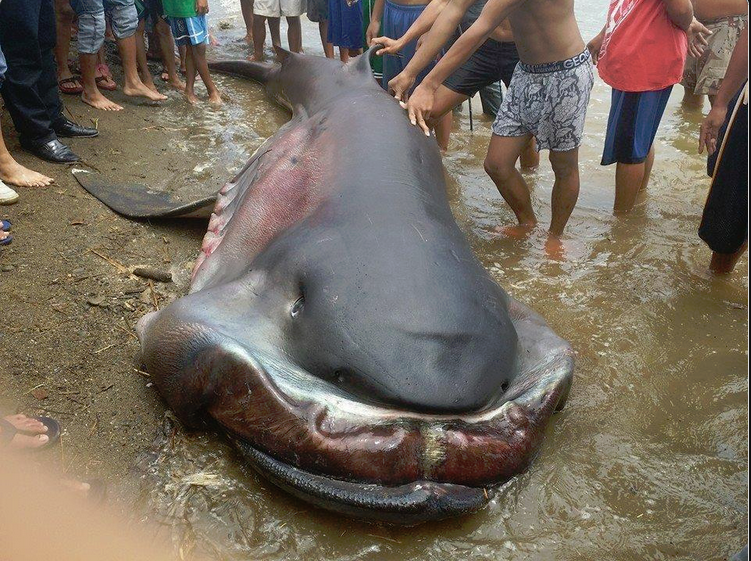 And today another Megamouth rolls up dead in the Phillipines. so very sad and heartbreaking and yet the mass media ignores this and doesn't want people to know the truth! ya the great ponzi scheme is aided by lack of real knowledge. So....was there any accumulation of radioactivity detected in the shark or sharks? What is the direct connection that they died of radiation related causes? They are filter feeders and plankton bio accumulate radiation around 70 times per week compared to what is present in the water. Did you read the article? Please review.